Jim Hoover in Science & Technology on 17 November, 2015. The Oort Cloud surrounds the furthest reaches of the Solar System. The Earth has had several mass extinctions in its 4.6 billion year history, for which we naturally try to attribute cause. Several extinctions have been studied to find reasons and/or patterns. Some sixty-five million years ago 75% of all species went extinct, including the dinosaurs. Somewhat recently, this extinction was ascribed to a comet or an asteroid hitting the Earth. First, the detection of a layer of iridium metals, then the discovery of a 112 mile-wide crater in the Yucatan Peninsula has made this the accepted contention. Then too, two-hundred-fifty million years ago, 90% of all species went extinct. Other extinctions were sought that might fit a periodic pattern, often looking for common cause beyond our own solar system. Some scientists theorize a periodic mass extinction cycle related to our solar system’s path through the Milky Way (MW) Galaxy. Unfortunately, there is scant evidence that involves such an extraordinarily large theatre of operation involving a 240 million year orbit in a galaxy we’ve observed only a few decades using more advanced tools of observation and involving a portion of our solar system never seen. This is not to say that such scientists should not seek causes and build hypotheses. It just says that we don’t have enough evidence to conclusively prove such theories, as such evidence is sketchy and incomplete at best. Thus we should hold off on predictions based on sketchy data. I cannot claim superior knowledge or superior credentials, compared to scientists who venture any of these claims. The fact is that there is not enough known about the composition of our galaxy and the dynamics of our solar system which traverses our galactic centre every 240 million years. It is a trip through an ever-changing medium of space in a cosmic time frame which we are necessarily light years tardy in observing and mapping. The distance is staggering and our measurements are of objects as they were perhaps up to 100,000 years ago. Now, admittedly, in the miasmic clouds of matter observed by more and more advanced telescopes, it’s somewhat a game of movement, gravity, and spectrographic readings, giving averages – of thickness, composition and such. But remember our solar system’s path gyrates up and down from the galactic plane, intercepting the centre plane every 30 million years. A longitudinal view of our gyrating solar system in its orbital course through our galaxy shows a path through stars and dust that is somewhat indeterminate in size and volume, but still the same scientists are making a case that mass encountered every 26 million—some, every 62 million years—is perfectly apportioned to dislodge comets in the Oort Cloud, a claim mysteriously fitting each hypothesis. With the Earth passing up or down through the mid-plane of the centre of the galactic plane once every 30 million years, theories assume the gravitational force of a cloud of matter – visible stars, interstellar clouds and even invisible dark matter – disturbs the comets in the Oort Cloud and sends some of them on alternate paths, sometimes crossing the Earth’s orbit where they collide with the planet. Now none of these complete processes occurs in a lifetime. We are speaking thousands, if not millions of years. From the time such an object might dislodge a comet from the Oort Cloud, for example, such an object must travel something like several light year (up to 93 trillion miles) if on a straight path to Earth, a straight path not being likely because of the gravitational forces of moons and planets in between, not to speak of the Sun. At any rate, we are speaking 10s of thousands of years, if not much more, before it might reach Earth, and consider large planets like Uranus, Neptune, Saturn and Jupiter are possible gravitational influences, not to speak of Mars, a much smaller planet – all between the Oort Cloud and Earth. That makes somewhat of a disconnect with the 26 million year perturbation effect of matter in the Milky Way (MW) galaxy, though cosmic time could put it in the ball park. 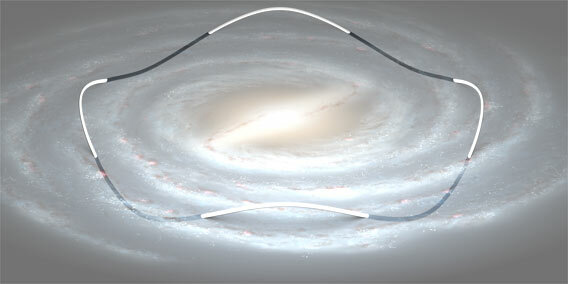 Consider the ever-spinning “roulette” of the Milky Way Galaxy. It has a diameter of some 130,000 light-years and a thickness of some 2500 light years, containing around 200 billion stars, probably as many or more planets and moons, with clouds of dust, and dark matter. Looking at another longitudinal image, we can see the various spiral arms—arms that variously move as does our solar system. Where these masses might be encountered and how thickly distributed or how dense is problematic for any periodic theory of Oort Cloud perturbation. Thus, to say that the cycle relates to passing the crowded disc of the galactic plane every 30 million or 62 million years must be based on very sketchy data. Do scientists assume the whole centre disc measures some 130,000 light years in thickness and that the centre is at a depth of some 65,000 light years? This doesn’t mean that scientists shouldn’t look for causes for catastrophic events. Certainly experience shows that the universe is an ever-changing environment, as is our own solar system. Our solar system’s formation period was one of complete chaos. Early in this period, ample evidence now points to a Mars-size object hitting the Earth with a glancing blow, resulting in the formation of our own Moon. We know that the Moon won’t continue being our satellite forever and we know that the Sun will become too hot to sustain life in some one billion years. Studying the Sun and stars with advanced satellites, and visiting the Moon, planting a mirror there for distance measurements with a laser, studying the Moon’s composition – all these things provided sound empirical evidence for these two predictions. Hailey’s Comet was thought to have left the Oort Cloud 10’s of thousands of years ago, probably due to orbital influences, outside or perhaps within the Oort Cloud itself. 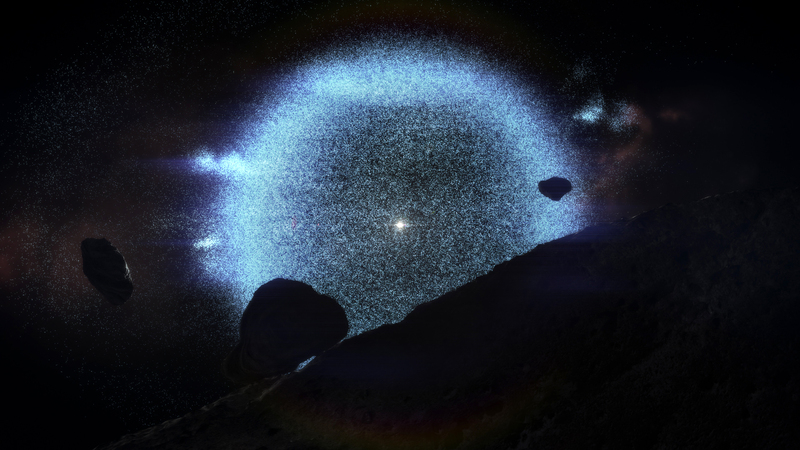 We must know more about the phenomena outside our solar system before we can reasonably predict extra-solar origins for gravital disruptions of comets in that belt. Our imprecise galactic map only deals with total mass and average density of matter but has no precision for the mass of some 200 billion individual stars, their life-cycle or status. Near-stars (brown dwarfs) and spent-stars are rarely seen or measured and their presence is only estimated. Understanding dark matter, mapping the contents of galactic matter, knowing more about the dynamics of our solar system’s orbit around the galactic core compared to other objects, understanding the gravitational affect of the MW’s super-massive black hole, and knowing more about our Oort Cloud —all this must come before providing dire predictions about future Earth extinction events. Nevertheless, Michael Rampino, a geologist at New York Univeristy, and Ken Caldeira, an atmospheric scientist at the Carnegie Institution for Science, advocates the 26 million year theory. In a recent study, they speculated that the next mass extinction may not be far off, in geological terms, anyway. “Our little corner of the solar system crossed the plane about 2 million years ago, and we are now moving up and through it.” The “plane” is where the bulk of matter is speculated to be – visible stars and their planets and moons, interstellar clouds, and even invisible dark matter. Of course, if the perturbation occurs, it might take disrupted comets in the Oort Cloud 10’s of thousands of years to approach Earth, that is, if their theory is right. Given the total lack of precision, the percentage probability would seem to be somewhere in the realm of less than one percent, with an occurrence time of plus or minus a few million years. But such predictions do tend to perk up popular interest.